1. A descendant of Caleb, the son of Hur (I Chron. ii. 50, 52, 53). 2. One of the towns of the Gibeonites (Josh. ix. 17), which belonged to the tribe of Judah (ib. xv. 60; Judges xviii. 12), on the border of Benjamin (Josh. xviii. 15; I Chron. ii. 50), to which it was finally assigned (ib. xviii. 28). At Kirjathjearim the Ark was kept before its removal by David to Jerusalem, having been brought from Beth-shemesh after its return from the land of the Philistines (I Sam. vii; I Chron. xiii.). 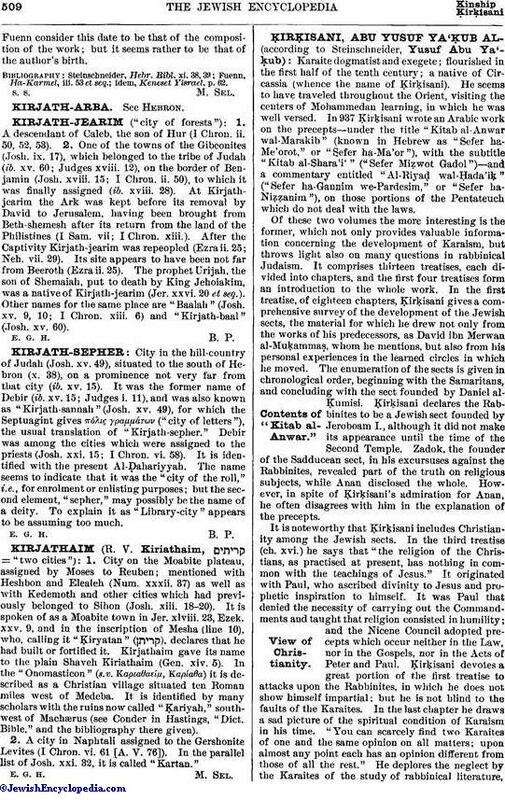 After the Captivity Kirjath-jearim was repeopled (Ezra ii. 25; Neh. vii. 29). Its site appears to have been not far from Beeroth (Ezra ii. 25). The prophet Urijah, the son of Shemaiah, put to death by King Jehoiakim, was a native of Kirjath-jearim (Jer. xxvi. 20 et seq.). Other names for the same place are "Baalah" (Josh. xv. 9, 10; I Chron. xiii. 6) and "Kirjath-baal" (Josh. xv. 60).